Here’s what’s up in the world of TV for Monday, February 11. All times are Eastern. 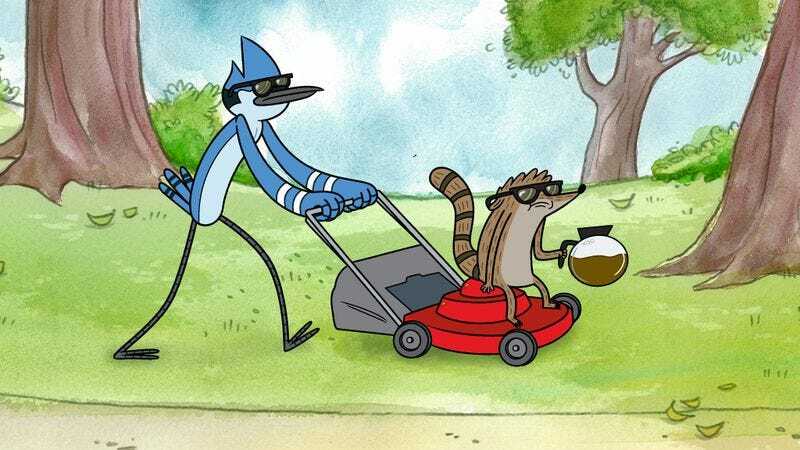 Regular Show (Cartoon Network, 6:30 p.m.): We can’t even really tell you why this is the top pick. Maybe it’s because it’s on at an unusual time, and we wanted to call your attention to that. (It’s been bumped by some weird awards show.) Maybe we’re doing so because it’s been a long time since it was the top pick—actually, has it ever been the top pick? Or maybe it’s because we just wanted to highlight an episode called “Do Or Diaper,” which implies the raccoon thing and the bird thing are going to have a hideous bird-raccoon baby. Alasdair Wilkins is preemptively shuddering. The Carrie Diaries (The CW, 8 p.m.): Is it just us, or does this show seem to be burning through storylines awfully quickly? Like, one week Carrie is just kind of sort of interested in her crush, and the next week, she’s turned into Sarah Jessica Parker? Carrie Raisler thinks the show needs to slow down. How I Met Your Mother (CBS, 8 p.m.): Uh oh. Robin’s going to realize just how much she likes hanging out with little Marvin, and we’re going to embark upon some storyline about how she’ll realize she really does want kids after all this time. Donna Bowman hopes she at least adopts a suitably awesome kid. Switched At Birth (ABC Family, 8 p.m.): It’s time for an anti-Valentine’s Day party, which we take to mean that if the party ever runs into an actual Valentine’s Day party, the universe will wink out of existence or something. Carrie Raisler would rather the universe keep existing, thank you very much. Bunheads (ABC Family, 9 p.m.): “There’s Nothing Worse Than A Pantsuit” says the title to this episode, and Erik Adams can think of several things that are worse than a pantsuit, up to and including those Skittles that are colored like one flavor but flavored like another entirely. Whose idea was that? Awful! The Following (Fox, 9 p.m.): This is the fourth episode Fox sent out to the press, and it’s also the final one. It might have been our “favorite” of the initial bunch, if that word has any meaning in this context, but God, the Kevin Bacon storyline is stupid. David Sims hopes you stick around for Bacon Bits. RuPaul’s Drag Race (Logo, 9 p.m.): We have to confess that when it comes time to write up these blurbs, we’re usually flying blind, because Logo doesn’t show up on TV Guide’s online listings, and we use those for everything. Oliver Sava thinks we should just say something generic, but we have pride. Batman: The Animated Series (1 p.m.): Wait. Jim Gordon is going to join forces with Bane? Did the producers of The New Batman Adventures even see The Dark Knight Rises?! It sure sounds to us like they did not. Oliver Sava wants them to remember when Bane almost killed all of the Pittsburgh Steelers. Bones (Fox, 8 p.m.): Hey, look! It’s time for Bones to do a weird hallucination episode, and it’s time for us to review that weird hallucination episode. Eric Thurm steps in to tell you about all of the deep symbolism inherent in Brennan’s trip through her subconscious, or maybe just if the butler did it. Monstresses (Biography, 9 p.m.): Finally! A docudrama version of Fatal Attraction for those of you who just can’t wait to hear about real people who are vaguely like Glenn Close in that movie, then perhaps worry that your own husband could be taking up with one of the monstresses. Kill him before he does! Bang Goes The Theory (BBC America, 10:20 p.m.): We know. We were excited, too, when we thought that BBC America had launched a post-episode talk show for The Big Bang Theory, sort of like what AMC did with Talking Dead. But, sadly, this is just some Top Gear pseudo-spinoff. Boo! Big Bang forever! Inside Comedy (Showtime, 11 p.m.): The second season of Showtime’s enjoyable interview series—in which David Steinberg sits down with some of comedy’s biggest names—kicks off with a perfectly matched bang, as Steinberg talks with Louis C.K. and Bob Newhart about the comedy of awkwardness. Little Women (TCM, 8 p.m.): Maybe you won’t believe us, but Katharine Hepburn is so good in this movie, even if she didn’t earn an Oscar nomination. The movie itself, as well as director George Cukor, did, however, and it even won the award for Best Adapted Screenplay. You know you want to watch! Live Free Or Die Hard (FX, 8 p.m.): Or maybe you’d rather watch this movie, which attempts to revitalize the Die Hard saga for a new generation and… well… Bruce Willis somehow hits a helicopter with a car, which sort of shoots the original movie’s ethos in the nuts, but, hey, he’s still often fun to watch. College basketball: Marquette at Georgetown (ESPN, 7 p.m.): In their last matchup, Marquette narrowly won, 49-48, so we’re hoping this game will be at least half as good. Oh, who are we kidding? We didn’t watch that game. We just read about it online. Anybody want to predict the AL West with us? Downton Abbey (Sunday): The gang at Downton is hurtling, pell-mell, toward the season finale, which can only mean one thing: Everything is going to get super-dramatic all at once. Sonia Saraiya will be there for the plaintive stares, the random plot twists, and the actors who obviously want to leave!